What evil genius worth his or her salt has not wanted to cackle maniacally "Your weapons are useless against me!" The best measure you can take is not to get shot at in the first place. No matter what care you take in your invulnerability preparations, some stray bit of lead can find its way to you and ruin your weekend. Bullets are tricky little devils, and so we here at evilHow recommend a multiprong approach to avoiding their ill effect: if one of the measures fails some proportion of the time, you still have the others covering you. 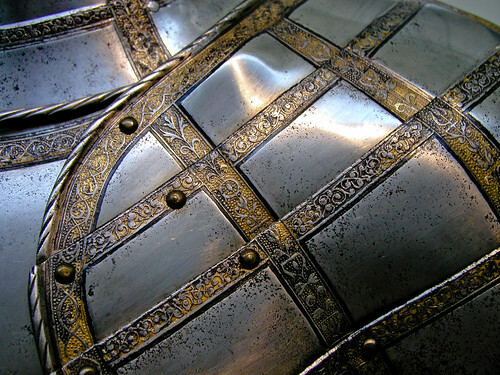 Armor. It always gets in the way, has chinks, and something will always get through. That said, it is often the difference between eating lead and living another day. Perhaps you can devise something light as air and penetration resistant as concrete . That would be excellent. Reflexes. Keanu Reeves (with whom we have much empathy) first popularized the maneuver where one twists away from shots issued at point-blank range, and now you see every superbad guy flailing around in such situations. Still, the technique is not to be despised and one may well wish to add it to one's bag of tricks, though it probably involves some expense enthralling a personal trainer, and a certain degree of commitment to a physical regimen. Skin. What it is what you can do with it depends very much on your personal makeup. Some supervillains find it quite easy and comfortable to incorporate a rhino-hide exterior or a metallic exoskeleton, while others find that it comes into conflict with their lifestyle. Those who are able to count on a thick skin, however, have the advantage of never being without their protection layer, a thing one appreciates after an assassination attempt or two in the shower. The downsides can be mitigated through the judicious use of moisturizer and/or polish. Dematerialization. This either takes the form of a misty, spectral appearance through which bullets pass harmlessly, or simply a case of not being there all of a sudden. Superhealing. Sometimes you can get away with taking a round or two if you can count on uncommon regenerative abilities carrying your through. Scorned by purists, who would rather not see even a tiny drop of blood to give a slight sense of vulnerability, it is nonetheless still a valuable addition to your arsenal, especially as a backup to the other other defenses you may still be in the process of perfecting. Work the ricochet. Additional points to the supervillain who not only has bullets bounce harmlessly off of him, but can deflect those bullets to inflict harm on his or her foes. The main obstacle here is dealing with the recoil imparted to your person by the change in momentum of the projectile, which can spoil your equilibrium. Even if you inflict a bit of a wound on the assailant, the whole effect is spoiled if in the process you make a pratfall. A Pilates trainer might be able to help with this however. Also, there is an art to ricochet aiming, angling your trunk just right, and you need to acquire the knack even to get the thing going in the general direction you require. To ease the learning curve, try donning a flat piece of sheet steel which you can angle just so, then graduate to more realistic armor configurations. Practice. Make sure your gun countermeasures work individually by trying them out on the range. But with rubber bullets or paintball guns instead, preferably on a volunteer! Superammo. Silver bullets and magic rounds can really mess up your plans. Here it is a case of more thorough research having been done by the forces of good instead of by your own team. So keep up with the arms race and be sure to test your body armor and other defense against exotic rounds as well as the conventional type. The switcheroo. The corollary to the old saying "Never bring a knife to a gunfight" is "Make sure the gunfight is a gunfight." If you are going to put in all those hours of hard work perfecting your gunshot countermeasures, do not be over-eager to use them in a circumstance where you might find them largely ineffective. Created by: GrinningSkull. Last Modification: Monday 09 of August, 2010 21:22:30 EDT by GrinningSkull.